The spotlight has re-appeared on Margaret Atwood as her novel, “The Handmaid’s Tale” will be appearing on television later on in 2017. As with most high school students, “The Handmaid’s Tale” was on my required reading list. I did go on to read other books by Atwood, further deepening my fascination with dystopia novels. Reading an Atwood is like soaking in a molasses vat of alternative reality. Your whole mind is comfortably sucked deep into the world until all sense of reality is suffocated out of you. No matter the tale, my eyes would take upon the world with a fresher yet wary perspective. Atwood novels are absolutely fascinating. Although to be frank, I remember more of how I felt afterwards than the books themselves. I cannot remember what Oryx and Crake was about except there was a deep lingering feeling of desolation and loneliness that trailed after the last page was turned. Seriously, I really do love reading Atwood’s novels. I was completely blindsided by my love for Atwood. The title alone is so bizarre but I suppose I was hoping for a majestic kind of character. A character who as sleek and powerful. From the three pages I was able to muddle through, this is far from that imagery. Which wasn’t the kick in the bucket. I can be pretty forgiving on a goofy character if there is relatability to it. Many of my favorite movies are well known flops but darn it I love the characters. It’s been a while now but I’m still feeling the revulsion just from reviewing the few pages I read. From what I read, there is a scientist named Strig Fleedus who is on the brink of creating some “secret project” of some liquid concoction. He is pressured by his ratlike boss to make it work. Lo and behold it does! Once Strig calls the boss, he is ordered to bring the solution immediately to him in the middle of the night. This is where I really throw my mental hands in the air. There is an indoor kitty cat named Ding that had to die by getting hit by a car. Which is already upsetting to this cat lady, but then in a weird comical sense, just as Ding gets hit, so does a random bird in the backroom. Then Strig gets hit by the same car going in reverse as he’s holding Ding’s lifeless body. No surprise, the flask with the mysterious substance is coating three bodies: a human, a cat, and a bird. You can guess where this going. Here is what I do know about this liquid: it is a powerful DNA altering substance. 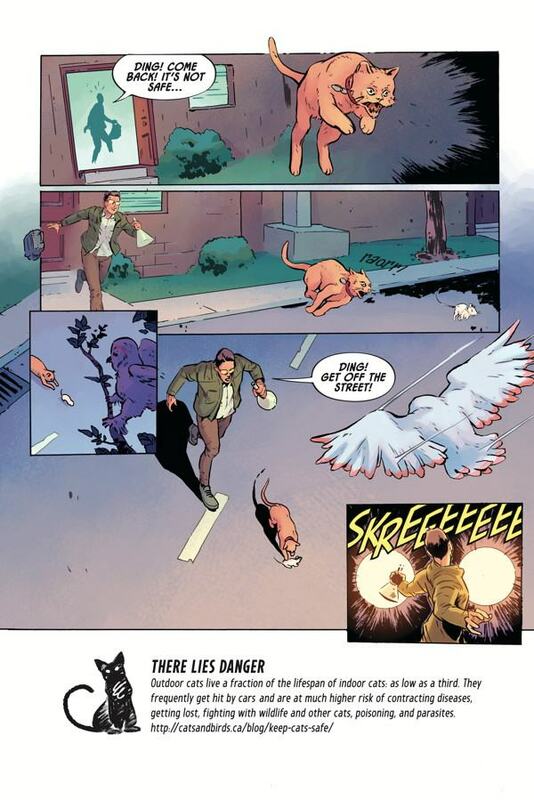 As it is able to morph Strig into the Angel Catbird. So now it bothers me even more that he was handling this substance without gloves. I hear the echoes of lab TA’s screaming in frustrated agony. How many safety rules have been broken? How am I supposed to take this character seriously as a genius? Even more disturbing was the almost campy and comical story progression from that point on. Strig’s devastation over Ding’s death is swept away as Strig discovers he can fly. He literally just leaves the body and flies away. Not even a glance to figure out what the hell just hit him or his cat? The next few panels he is shown returning to work and having cat like thoughts. Now it reminds me of Halle Berry in Catwoman (2004). There was no way I could keep going on. How frustrating is it to be lured in by a beautiful comic cover and discover that the art between the pages is not even close? The cover suggests a solemn yet epic story waiting to be told. The idea of a character being a cat and a bird would never have been an issue if the story and the art delivered on it. The style and humor is more reminiscent of a vintage Superman comic strip. Completely at odds with my expectations of what Atwood could have brought to the graphic novel landscape. 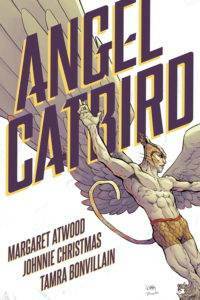 Although Atwood greatly disappointed me with this graphic novel, she will still be one of my top authors. An artist should always have the right to express whatever art they want. Even if it doesn’t impress the fans, an artist should just keep creating. Admittedly, from a fan’s point of view, this is almost akin to seeing a favorite pop star releasing a country album. Still love the voice but this version is not for me. Until next time. 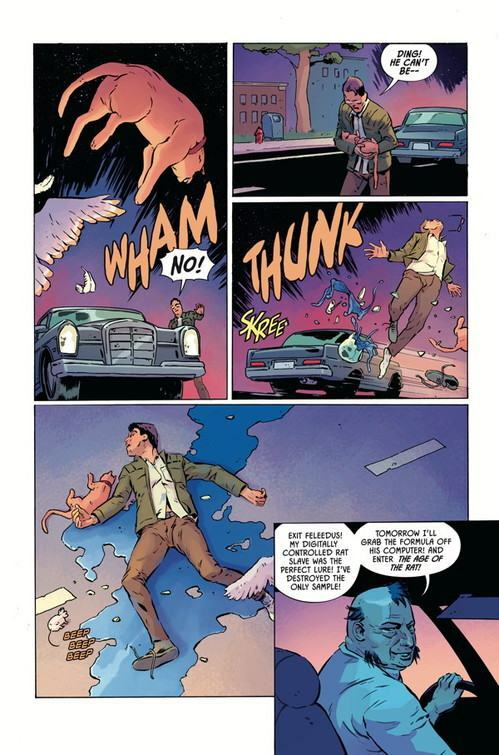 I have to confess that I felt the same thing about Angel Catbird when I read it. I don’t remember ever reading any of Margaret Atwood books (maybe the Handmaiden’s Tale after seeing the original movie – not the upcoming remake), but have known and respected her reputation as an renown author. Every writer has the right (or even want) to do something outside their comfort zone and experiment a little. Sometime it works out well, and sometimes it doesn’t. 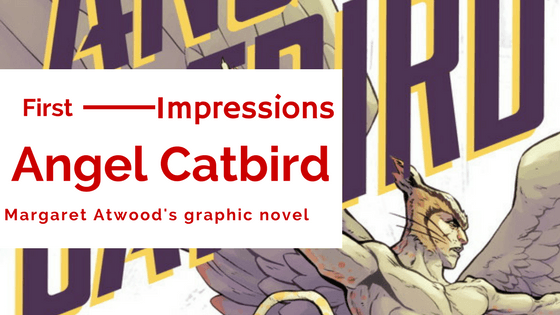 Angel Catbird has a third volume coming out and I most respectfully decline on reading volume two and three. 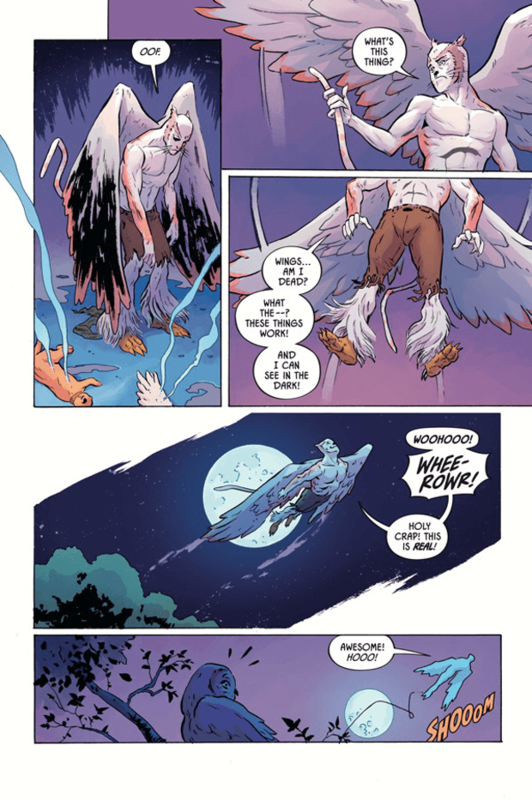 From the sounds of things, I think I’d enjoy Angel Catbird more than her other work.